ISTEP+ is officially history, after 2017, that is, which is the last year that the ISTEP will be given to Indiana students. With the stroke of his pen today, Gov. Mike Pence put an end to the Indiana’s decades-old standardized ISTEP exam and officially started the clock on a plan to replace it. The ISTEP will be administered just one more time — in 2017 — giving the state a little more than 700 days to figure out something new. Signing the bill at Eagle Elementary School in Zionsville, Pence told the children gathered for the bill ceremony that they shouldn’t get too excited about ISTEP’s departure. The “good news” was that ISTEP would be no more, he said, but the “bad news,” is that there will still be a test. That comment was met with groans from the kids. It's interesting that Indiana's Democratic Superintendent of Public Instruction has been fighting against Republican Governor Pence over ISTEP (and nearly everything else) since she took office. Now that it's an election year, and the public has turned against ISTEP, Pence is eager to "find something better." After years of tinkering with the state’s education policy, including withdrawing from the national Common Core standards, the decisions by the GOP-majority Legislature now pose a political liability, because parents and educators have become increasingly weary of high-stakes testing. And ISTEP scores plummeted about 20 percent in 2015 when compared to the previous year due in part to a hastily rolled out test that was based on Indiana-specific standards for math and science instead of the Common Core. While Democratic State Schools Superintendent Glenda Ritz has long called for student testing to be rethought, the idea to scrap the ISTEP did not gain currency until recent months with Republicans, who have supported school accountability measures that use student performance on the standardized test to determine school grades and help award teacher merit pay. Pardon me for not celebrating the demise of ISTEP, but the worst aspects of it will remain. 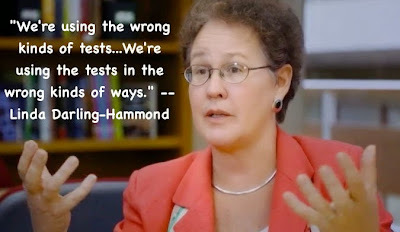 We're not getting rid of high-stakes testing. We're not getting rid of the abuse and misuse of a test on students, teachers, and schools. We're simply going to change from ISTEP to some other standardized test. The governor said we're going to "make a new test that works better." On what basis should we expect the State of Indiana, which "made" the ISTEP to suddenly be able to "make" something better? Testing is a complicated process and questions have to be carefully chosen to remove biases and errors. Now that ISTEP is gone, how is the state suddenly going to provide the expertise to make a "better" test? Hire Pearson? CTB? Are there any "test experts" left who aren't just trying to increase the company's bottom line? Then there's the possibility of getting an "off the shelf" nationally normed test, but that wouldn't necessarily be aligned with Indiana's standards. Would it be fair to require teachers to teach certain standards and then test students using an instrument that didn't reflect those standards? Does the legislature care about fair at all when it comes to students, teachers, or schools? And, as long as we're asking questions, why is it that the legislature is micromanaging Indiana's testing program to begin with? Isn't that a job for educators? Of course, when the purpose of testing has changed from assessing student progress and helping students learn, to "accountability" in order to bust unions and privatize education, it all makes sense. Test misuse in Indiana isn't going away with the demise of ISTEP. If we're still using some standardized achievement test as a high-stakes measure to determine student placement, teacher effectiveness, or a school's letter grade, then we're still misusing the test, no matter what that test is. Standardized achievement tests accurately measure a student's knowledge of the material covered on the test – and nothing else. But we're going to take a different achievement test which was developed and field-tested (hopefully) to measure children's academic achievement in specific areas and we're going to use it to evaluate teachers and to punish or reward schools. That's akin to using a blood test to determine if your leg is broken. ...the weakness is that assessment tests are not able to account for the wide range of variables, besides student knowledge, that could affect test results. In the pursuit of expediency and efficiency, combined with a trust in the objectivity of tests, the data acquired from test results are often inappropriately applied to different education policies and curricular reforms. A significant example was shown in the inability for test results, to accurately determine education quality. 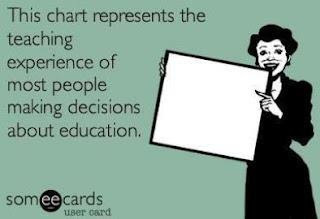 Drafters of education policy and developers of school curriculum primarily reference assessment test data to solve problems the data does not relate to. The problem we have with testing in this country today is that, number 1, we're using the wrong kinds of tests, and number 2, we're using the tests in the wrong kinds of ways. We are the only country that tests every child, every year with these kinds of measures and then attaches all of these stakes to them -- whether a kid gets promoted to the next grade, whether they graduate, whether a teacher gets a merit pay bonus, whether they even keep their job, whether schools get rewarded or sanctioned or even closed down. The tests were never designed to support these kinds of decisions. They don't even measure the things you would need to measure to be valid for those purposes, in ways that would inform you. Getting rid of ISTEP won't improve education in Indiana. Getting rid of inappropriate high-stakes testing, and the politicians who continue to support it, will. Baseball Interlude: No Foreigners Allowed?